On the lower level of the Campbell Pottery Store is one of the loveliest galleries around. In the lower level of the Campbell Pottery Store is one of the loveliest galleries around. Once the milking area of a barn, it was renovated in 2001 to a warm and inviting stone gallery—a space worthy of many art objects, but especially appropriate for earthy handcrafted items such as the pottery exhibition now showing. 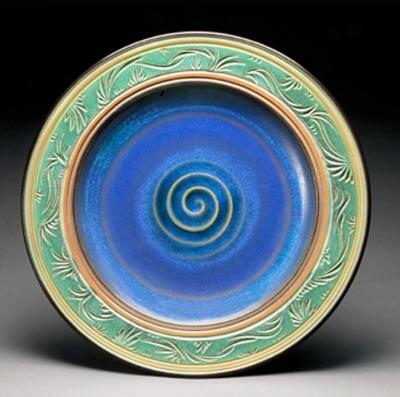 Though Paul Jeselskis has won numerous awards, and is a nationally recognized name, he is not new to this area, having graduated from Edinboro University of Pennsylvania with an MFA in Ceramics in 1988. He now manages a pottery business in Michigan, with a line of porcelain work, which he has developed over the last 24 years, being both functional and decorative. In most cases, he forms the work first on the potter's wheel and then manipulates the surface one way or another before applying his bright glazes. This is a cash and carry show, meaning that what I saw on my visit may well not be there when you arrive, and judging by the popularity of his work, this is entirely likely. However Mr. Jeselskis is so prolific that anything sold will be replaced with something else equally delightful, so there is little chance of going and finding the show "picked over." Upon entering the gallery, I was immediately drawn to a red jar with lid, an elegant and classic design in a rich burgundy copper oxide glaze, which he has been perfecting for 20 years. Copper oxide glazes are intensely prized by local collectors, and seemingly few potters use them. The results are stunning, such as the "Relish Tray Set," a tray with two bowls glazed with burgundy shapes going to ultramarine blue, with slashes of cerulean throughout. Pickle relish never had it so good! Another in this glaze are the "Nesting Bowls," the lip-edge raising and dipping like a rollercoaster ride, rather than the conventional circle, the total having the effect of looking into a giant red rose. In deep contrast to this is his iron glaze, which gives a mottled earth tone with flecks of gold through it. Among the pieces so glazed are a couple of "Tall Vases," which are at once modern and still look like they could have come from an ancient archeological site. Among my favorite pieces were some lidded jars, with carved designs, in a turquoise glaze, trimmed in black. It was easy to imagine a young lady storing her special keepsakes in such a jar for special moments of reverie. On the walls were a number of "Platters," the outside edge with carved patterns and glazed in an earthy green and the interior in ultramarine with an incised vortex in the center. I was also drawn to a large dusty-yellow vase, which was of the type popular in the '70s, with a large bulbous body narrowing to a reed-like neck. The antecedents to this shape are Asian imports, which were coming to America during that time. A number of the pieces have deeply carved surfaces, which when glazed in green, have the effect of growing grass or rushes. Of these, the newest designs are the little "Onion Vases." Many have such innovative glazing; which with the carved designs, there is an intriguing optical effect achieved. All of these pieces are of high-fired porcelain, making them not only pleasing to the eye, but durable functional pieces as well. And it should be mentioned here that these pieces are very reasonably priced, making them easily affordable to collectors on a budget. But budget or not, anyone who loves pottery should not miss this show. This exhibition continues to May 13, at the Stonewall Gallery, which is located in the Campbell's Pottery Barn, 25579 Plank Road, Cambridge Springs and is open 10 a.m. to 5 p.m. daily. No, this isn't about gnawing on a postal carrier's bag.